Here are links to the braiding tutorials on my blog Loop Braiding. Almost all are fingerloop braiding tutorials, but there are also a few on hand-held loop braiding. This list doesn’t necessarily include all my color-pattern how-to’s. Check out the Color-Patterns tab in my upper menu for links to color-pattern variation tutorials. Try your own color variations, too! Tutorials are listed below in order of difficulty – except for the 2-Loop Braid, and Spiral braids of 4 to 10 loops. I don’t have written posts for them, just video links near the bottom of this page. Jump to them here. Spiral braids are probably just as easy to learn as 5-loop square and flat braids, but they don’t prepare fingers for the important “loop-shifting” moves of most other braids. The 5-loop braid in my “Start Here” tutorial is a great beginning point for learning all the other braids I teach here. “Too-many-loops” braiding tutorials are listed just below Tips and Tricks. Those are the braiding methods that require using thumbs – which really isn’t ‘too many loops!’ and holding more than one loop on certain fingers. Caveat: I’m not a professional videographer. The videos in my tutorials are clear, but tend to be pretty slow, with a lot of talking. My more recent videos usually have a timeline/ table of contents listed below the video to help you skip to the point you want to see. My header image above isn’t specific to the tutorials, it’s at the top of all my pages, just a blog decoration photo I took back when I started this blog. I have links below to tutorials for four of them (and for lots of braids that aren’t shown in the header). From the right edge: 1st: 7-loop square braid, 2nd: 8-loop spiral braid, 3rd: 10-loop double braid (solid rectangle), and 7th: Lace Dawns (8 loops). There’s information about all the header photo braids here. To get a heads-up when I make a new post, click at the top of my sidebar to follow Loop Braiding, and you’ll receive an automated email alert when I publish something. I post sporadically, 0 to (rarely) 2 times a month… Sometimes there are long gaps between postings, but more braid and color-pattern tutorials are on the way. My site has no commercial or affiliate links, and my youtube videos are not ‘monetized’. If you appreciate this blog and would like to give my braiding and blogging spirits a boost, please comment under any of the posts – and PLEASE let me know if you used one of my tutorials! You can also subscribe (free) in upper right sidebar, and/or drop something in my paypal ‘tip jar’ near the bottom of the sidebar – either of those give me a boost as well. Super-easy 3-loop braids. Downloadable pdf photo-tutorial and several videos. An even easier intro to fingerloop braiding than my original “Start here” tutorial below. Several color-pattern and shape variations taught. Start Here: 5-loop braids, both square and flat. Videos, photos, text. If these 5-loop videos are too slow-paced for you, learn from the faster 7-loop video below (but use only 5 loops to start with—just omit the lowest loop on each hand, and use the ring finger to braid with rather than the little finger). If you’ve already learned the square, flat, and divided 3-loop braids above, you may be able to learn how to braid with 5 loops just by looking at the diagram at the beginning of the tutorial. Continue Here: 7-loop braids. Video tutorial showing the 7-loop version of the basic square, flat, and divided fingerloop braid introduced in the “Start Here” tutorial. This video is a little faster-paced than my 5-loop videos. Shows all 3 braid variations in one video (square braid, flat braid, and divided braid). 7 loops gives a lot more color-pattern possibilities and an even more impressive-looking braid than 5 loops! 7-loop D-shaped braid (an “unorthodox” braid). A fun variation of the basic 7-loop square braid, with a distinctively different shape and color pattern expression. Try any color setup you’ve liked for a square braid with this D-shaped braid and see how it comes out! Bicolor loops. When each loop is made out of two different colors – two different yarns tied together – different types of color patterns become possible than when loops are made out of single colors, and it is also much easier to switch between different color-patterns within one braid. The bicolor loop photo-tutorial shows how to make three different bicolor patterns for square braids of 5 loops or more. I use only two colors in the photo-tute, but you can go on from there to adding more colors. Bracelet tutorial for a 7-loop square braid, also how to braid one of my favorite square braid color-patterns: “Chevrons across Bicolor Stripes” – a mix of bicolor and single-color loops. This tutorial teaches 2 great color patterns for a 7-loop square braid, and some bracelet tips, but not the basic braiding moves. Learn the braiding moves from the 7-loop “Continue here” tutorial above. Color-linking can create amazing braid patterns! This video-based tutorial teaches 2 different types of color-linking in a 7-loop flat braid (also some 9-loop set-ups). Learn 7-loop flat braids first (see above). Color-linking adds another step to the braiding procedure. This braid is about as thick as a 4-loop square braid, but twice as wide. I call that braid-shape “rectangular”. Video, text, photos. The video teaches one possible color pattern: ‘Lopsided Crowns’ – It’s not my favorite color-pattern; I chose it for the video because it has the simplest starting arrangement of colors on the fingers. Several other color-patterns are taught in the text, below the videos. (I recommend the “Edge” color pattern as the easiest one to error-check while braiding.) This braid is the base, component braid of the doubled 14-loop letterbraid – a way for a team of two braiders to braid words! The video shows a different way to turn the loops during the loop transfers. Less slo-mo – better to learn the braid from the previous link above. Also shows how to unbraid the spanish braid – this is very useful for correcting mistakes, which is what I’m doing in the video. How to use Gary Mitchell’s online pattern-planner for the 7-loop spanish braid above. Two posts – one introduces the planner and shows several sample charts, and the second has a video showing how to follow a chart once you have generated it from the planner. It also has a photo showing several different braid patterns you can make using the planner. Douglas Grant’s round version of the 7-loop spanish braid (or not?) Great variation of the above braid – perhaps different enough not to be quite “spanish.” Makes a firm, round braid. Invented or discovered by a blog reader who named it the Spiaggian Eagle braid after one of its color patterns. Text instructions for two alternative braiding methods. Several color pattern variations shown and taught. I love this braid! Team braiding a double braid: Video of two first-time braiders making and demoing a 10-loop double braid together. This is two 5-loop square braids connected together to form one larger, rectangular-shaped braid! Also a photo-tutorial on the crucial move that connects the individual 5-loop braids of the two braiders – the loop-exchange move. If both braiders have first learned my “Start Here” 5-loop braid, you really can to learn to make a double braid from this post – try it! My patented 😉 solo-braider method for making the classic 2-person loop braid taught above. This is really 3 different tutorials: one for a 6-loop version (doubled 3-loop braid), one for 8 loops (doubled 4-loop braid), and two videos on the full 10-loop version (but learn the 9-loop square braid first, to get used to transferring and shifting loops to and from the thumbs – that is too much to learn at the same time as learning a ten-loop double braid). Plug: Double braids have 8 or more shape variations, compared to the 3 of square braids (square, divided, flat), and each shape variation has distinctive color patterns not possible with the other shapes! This is true even for a 6-loop double braid, which only requires three loops on each hand. Double braids, part 2: 6 to 10-loop Flat double braids. Also, some great color-manipulation tricks for making borders and other lengthwise designs. (color-linking in two different forms) A separate no-sound video for each skill taught, 8 and 10-loop braids. No video for the 6-loop version. If you’ve learned the 6-loop double braid from the previous tutorial, follow the 8-loop videos and just omit the loop on the little finger. Double braids, part 3: 6 to 10-loop Hollow double braids. No video. (The video for the flat double braid above can be followed to learn the hollow double braid as well – there is only one minor difference.) Instructions for several different color-patterns of 6-10 loop braids, plus photos of examples of up to 18 loops. Keyhole-type openings in hollow braids, bead and disk inserts, bicolor patterns, color-linking. Also text instructions for another double braid shape—the side-slit rectangle braid. Photos and accompanying set-up instructions of 11 color patterns for flat double braids, plus one solid double braid color pattern, one hollow, and 2 side-slit rectangle color patterns. The side-slit rectangle shape seems to have been commonly used for purse-strings in Medieval and later periods. * It looks a lot like the solid rectangle double braid, but with maybe a slightly neater appearance to the edges and some distinctively different color patterns when bicolor loops are used. 2 methods for making square and flat braids with hand-held loops. 2 videos, braid photos. Demo’ed here with 5 loops, although traditionally, 5-loop square and flat braids would be made with fingerloops – handheld loops were only for holding and braiding with more loops than could easily be managed with finger-held loops, as well as for braiding certain unusual braids that cannot be made with finger-held loops. Kute-uchi is Masako Kinoshita’s term for traditional Japanese loop braiding (to her the term encompasses both hand-held and finger-held loop braiding), which preceded and led to Japanese stand-and-bobbin braiding (kumihimo). the Genji-uchi braid, and the closely related Pseudo-Genji-uchi (of 4 to 36 loops). I added these instructions onto the end of my original kute-uchi tutorial above. These two Japanese braids are made using both of the two braiding moves taught in the two original kute-uchi videos. The new braids can be learned from watching and practicing each of those videos, then reading my explanation of the color set-up, and the order of the two braiding moves when you combine them in making Genji-uchi or Pseudo genji-uchi. This post isn’t a tutorial, exactly, but it has necessary background info for the following (in-progress) series of video tutorials on how to make braids with two-color motifs and patterns that can be planned and manipulated by the braider. Pick-up patterning in European loop braiding was exemplified by the designs and lettershapes of the 17th C. ‘letter braids’ – team braids with braided sayings / inscriptions, as well as decorative symbols and motifs. Intro to using pick-up charts for switching seamlessly between bicolor patterns in a 6-loop square braid. These pattern charts are for ‘automatic’ bicolor loop patterns, but the switching process to get from one pattern to another requires a few rows of selective pick-up. Combining two automatic patterns together into one larger ‘combo-pattern’ also requires a bit of selective pick-up each time you switch back and forth between the two patterns. Three videos: one on following a chart, and two extras that cover starting and finishing with a tassel of mini-braids at each end, as well as how to ‘turn twice’ – a pickup technique that comes in very handy for square and flat braid pick-up. Pick-up charts as well as loop set-ups for several easy ‘automatic’ flat braid bicolor patterns for 5 and 7 loops – the charts aren’t necessary for these, you can just use the provided loop set-up positions for making each of these automatic patterns. (The charts are useful for switching between these patterns within one braid.) How to do flat braid pickup. Some ‘real’ (selective) pickup pattern charts for flat braids. New tips for how to avoid the 3/4-flat braid shape and always get ‘fully-flat’ flat braids. Videos, charts, text, photos, tips. Pick-up 4: Introducing an online pick-up pattern planner for Doug’s Braid! Gary Mitchell’s ‘FingerTips’ braid planner site now has an interactive pattern generator for planning pick-up patterns for one of my favorite braids – Doug’s Braid. It’s a round braid, so pick-up patterns display on it in a very interesting way. This tutorial teaches how to read and braid from a chart to make Doug’s Braid pick-up patterns, and how to plan them yourself using the FingerTips planner. Charts given for several fun patterns. Does anyone want a video with this last tutorial? If so, is there a particular part of Doug’s Braid pickup that you are the most interested in seeing in a video? At this point I’m trying to decide whether to keep going with pickup patterning tutorials, so any feedback would be very useful! Fingerloop Braiding, Lois Swales’ and Zoe Kuhn-Williams’ site. Terminology – not a tutorial, this is one of my ‘about’ pages (upper menu tab, right end). The first part explains terms I use in many of the tutorials, and the second part is a glossary of braiding/ weaving terminology, with a lot of over-explanation of how those terms relate to the actual thread passages – the underlying structural ‘architecture’ of loop braids. Not a tutorial, just some ideas and links in my answer to a question from Lan N in the comment field below. Ways to set down your loops in the middle of braiding. Color-pattern planning: How to arrange loops on your fingers to get the color-order you want in the braid. Includes color set-ups for several 5 to 8-loop square, flat and double braid color patterns. Zig-Zag Patterns in Flat Braids: NEW! Essentially Part 2 to the Color-pattern Planning post above, this covers how to arrange bicolor loops on your fingers to get the color-order you want in a flat braid. Includes color set-ups for several zig-zag patterns for 7-loop flat braids, and 8-loop flat double braids. Ways to braid LONGER loop braids – up to several feet or yards/meters (first part of post). Photos, text. Unbraiding, and fixing mistakes: Unbraiding is the best way to go back and fix a mistake. The video shows how to unbraid a 3-loop braid. There’s also a link to a video demoing how to unbraid a 7-loop braid—the same principle holds for 5-loop braids. Nine and 11-loop braids are unbraided a bit differently, I give a text description of how to unbraid them, and also how to work your way through undoing a mistake, once you have unbraided back to it. Unbraiding loop braids is not hard! I teach it in beginning loop braiding workshops. Fixing a mistake may require a little experience, but unbraiding back to it can be learned right away. Ways to start a braid with a loop and no loose ends at the start of the braid (click on link, then click to go to second half of the post). Text and photos. Using beads with loop braiding: This is more of an ‘ideas’ post, not a tutorial, but it includes some useful tips for incorporating beads into your loop braiding. Why I chose wordpress.com to host my site – as a non-techie who doesn’t (or didn’t, anyway) know anything about web design, coding, etc. For some reason this side-note is at the end of my Kute-Uchi tutorial. I don’t actually consider the first tutorials below to be “too many” loops! They do require using your thumbs to hold loops, but the thumb is as nimble and versatile as the index finger. Braiding with nine loops and thumbs has been documented historically from Finland and – unpublished, but known to me by personal communication – from China. I strongly suspect it was a very common practice in earlier eras, wherever the “little-finger-operating” loop braiding method was used (a.k.a. the “v-fell method”). 9-loop braids: (square and flat braids, also info on unorthodox variations) Requires using thumbs. Go ahead and try 9-loop braids as soon as you are fairly comfortable making 7-loop braids. [rationale here] Two videos, photos, text. The way I demo using thumbs is the basis for how I braid all braids of more than 8 loops. Miscellaneous info in the “notes” section following the tutorial: historical references to 9-loop braids, current revival of loop braiding, how I found out about loop braiding. Unorthodox braids of 9 loops: In the notes section following the main 9-loop tutorial. Text instruction for 2 unorthodox (UO) braids, and how to come up with more on your own. Unorthodox braids deserve a whole series of posts/tutorials that I haven’t gotten to yet have just started on (see the 7-loop D-shaped braid, and A Triangle Braid [for 5-9 loops]). I have an information page about unorthodox braids here. Lace Dawns and Lace Piol Alternate method to the one taught in the medieval manuscripts. This is a much quicker way to make these 8-loop braids (if you are used to using thumbs, as taught in my 9-loop tutorial). This 8-loop braid only requires using the thumb of one hand, so it may be a good way to practice up for 9-loop braids. Video, text. 11-loop braids. (square, flat, also info on unorthodox variations) 2 videos, photo-tutorial, text. Requires holding a loop on each thumb and 2 loops on the little fingers. Wait til 9-loop braiding moves are automatic before moving on to 11 loops. The way I show of dealing with the extra loop on the little finger (along with loops on the thumbs) is the basis for how I make almost all braids of more than 10 loops, including double braids of 12-18 loops, the 14-loop letterbraid, and most of the braids in my header photo. Demo: 12-loop double braid (hollow variation). My method for 12-loop double braids requires holding two loops on each little finger, and one loop each on all other fingers (incl. thumbs). By “demo” I mean a very brief tutorial, mostly consisting of a single video, showing the braiding moves for one variation of the braid. 13-loop square braids (flat, and unorthodox as well, depending on how you perform the loop transfers). This is a text-only how-to, at the end of my photo-tutorial for 11-loop braids. (I’m hoping it might not need its own video—once you’ve learned the 11-loop braid, this one is very similar.) In the Comments section below my 11-loop tutorial. Learn the 11-loop braid first, add two more loops only after 11-loop braiding moves are automatic. Demo: 13-loop square braid with color-linking. The braid I’m demoing is actually the flat variation of a square braid. Video demo. There are a lot of extra moves in this braid because of the color-linking, so this video will probably not be very helpful for learning regular 13-loop square braids. Each transfer that includes a color-link requires two transferring moves. [new] Notes on my method for making the 14-loop Letterbraid as a solo-braider. No video or photos. General strategies, and detailed descriptions of moves. Requires using thumbs, and carrying 3 loops on the little fingers. Re learning braids of more loops: The progression must be one step at a time. It’s pretty much impossible to learn 13-loop braids before learning how to make 11-loop braids. (Ask me how I know!) Loop braids are faster to make than similar-sized macrame-type knotted pieces, once you’ve gotten used to making them. But unlike making a wider macrame piece, each increase in the number of strands for a fingerloop braid requires learning a new physical skill or two. If the braid you want to learn has more than 8 loops, my 9-loop square braid tutorial is a necessary prerequisite. The 11-loop square braid is a necessary prerequisite before learning braids of more than 10 loops. And the 13-loop square braid will be very helpful to learn before braids of 14-18 loops. I shot these 2-loop and Spiral Braid videos a long time ago, to accompany a series of photo-tutorials I was making for the yahoo [now groups.io] discussion group of The Braid Society: Braids and Bands. You can link to the videos directly below. However, their text-and-photo tutorials are not available here, only on the Braids and Bands homepage, under their “FILE” tab (after you join the discussion group). There the text tutorials can be viewed or downloaded in PDF form. Copyright applies, download for your own use, not to sell, and not to post online. 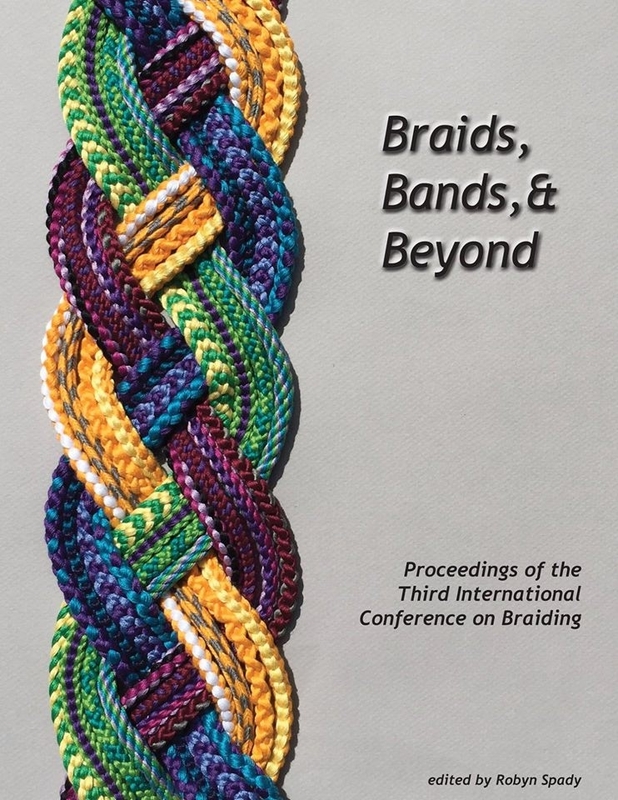 The discussion group Braids and Bands is open to anyone to join, not just members of the Braid Society, even though the Braid Society sponsors and monitors the discussion group. You’ll need to join the discussion group in order to access its files of numerous online tutorials, but this is easy – membership is open to anyone except spam-bots. You can unjoin even more easily, or set your email preferences to daily or weekly digest, or to “no emails” and only read the discussions onsite if you don’t want to receive them in your inbox. Note: If you download my pdf photo-tutorials on the spiral braids, be sure to also download the tutorial on the 2-loop braid – it contains the step-by-step photos for the basic braiding move for all these braids, so it is prerequisite material for all the spiral braid text tutorials. The photo-tutorials for the Spiral braids do not repeat the step-by-step photos of the basic braiding move given in the 2-loop tutorial. They only show the loop set-ups and the braiding sequence for each type of spiral braid (as well as photos of a keyfob braid project). 4-loop Spiral braid, part 1, incl exchanging loops without turning them. note: 4 and 8-loop spiral braids are documented in various loop braiding manuscripts from 15th C. England. I extrapolated the 2-loop, 6-loop, and 10-loop versions I teach in the links above. They are not “documented” as far as I know, but are obvious if you are familiar with the 4-loop and 8-loop versions (and are not averse to using your thumbs), and have very likely been made by others before me. The 8-loop method for making two separate 4-loop spiral braids simultaneously was obvious to me only in hindsight! A new braider discovered it by accident right before my eyes while I was teaching her the 8-loop spiral braid. This is a quick and attractive way to form a loop/ opening in an 8-loop spiral braid. Using a thicker thread or yarn for one of the two colors, and a much thinner one for the second color creates a wonderful thick-thin spiral – there’s an example in my header photo at the top of the page, second braid from the right (I used a variegated yarn for one of the colors). The 10-loop video demos this, but it can be done with any number of loops. Check out Dominic’s bracelet for a one-color spiral braid. This makes a great texture. “Spiral” braids can also have other color patterns than the spiral one, including lengthwise striping, a spiral with 2 lengthwise stripes (like seams) on the two sides of the braid, various dots, and a pattern similar to the classic “Grene Dorge” or Barleycorn pattern. To get other color patterns, vary the way you set the colors on the fingers at the start of braiding. If any two loop-exchanging fingers carry 2 different colors, there will be a “polka-dot” stripe of those two colors on both sides of the braid. To make this clearer, the other fingers should all hold loops of a third color that contrasts well with both polka-dot colors. The resulting color pattern will be similar to the color pattern of the classic braid called Grene Dorge in the old manuscripts (a.k.a. “Barleycorn”). If all but one of the fingers holds black loops, and one finger holds a white loop, you will get a black braid with a column of white dots on both sides of the braid. You can make spiral braids of up to 20 loops braiding solo, but it requires more patience. Each ‘extra’ pair of loops (beyond 10) requires loop-shifting moves at the end of each cycle to get the loops back into starting-position. These loop-shifting moves (for me, anyway) require a fair amount of help from the other hand, unlike square and double braids, so “too-many-loops” spiral braids are slower to make than double braids of the same number of loops. * Loop braiding encompasses both finger loop braiding (“finger-held loop-manipulation braiding” is a more technical term), and hand-held loop braiding—see my kute-uchi tutorial, as well as the photos near the end of my piece on Rodrick Owen and ancient Peruvian flat braids. * (re side-slit rectangle double braids as purse-strings in earlier periods) Judging from some of Noemi Speiser’s descriptions of medieval and later purse strings on extant museum artifacts. I don’t have the sources at hand but my memory is that I have seen this shape mentioned by her more than once in describing purse strings. Thank you SO much! “Hit the jackpot”! You’re welcome! I hope you have fun braiding! Hi Wendy, Maybe what you are looking for is the two-strand cord (it looks like a braid, but the method seems like making two enmeshed crochet chains!) that I have a link to in my sidebar. Check in my sidebar under “other braiding sites” – somewhere in that list of links is a link to a tutorial by Jean Leader for a ‘two-strand braid, easy and pretty’ — I hope that helps! You’re welcome, and thanks for the note! OMG! I just discovered your website and I’m jumping for joy and overwhelmed at the same time! Loop braiding classes are going to be a wonderful addition to my new spinning and weaving shop (once I learn to do it). I see a downloadable pdf in the list above. Is there a BOOK somewhere? I will certainly watch some of the videos, but I’m generally annoyed by videos. (I know, it’s a personal failing.) THANKS! I love your enthusiasm! Thanks in advance for spreading the technique out further! My super-easy 3-loop intro, and the nine-loop and eleven-loop tutorials. I’ve also made some photo tutorials on spiral braids that you can download from the Braids_and_Bands yahoo discussion group (See the end of my post on 3-loop braids for details). Spiral braids are great to teach to beginners. Please contact me first if you would like to use any of my videos, text, or photos directly in your classes, or just check out the FAQ’s there on my contact form, thanks! No need to contact me if you are using your own words and images, of course. The first braid I usually teach is the 5-loop square braid. That tutorial is mostly video-based but also has photos and text, including a diagram of the basic move—if you learn the 3-loop braid first, you could probably learn the five loop one just from that diagram. I can confirm that the 5-loop braids (square, divided and flat) can be quickly learned from Ingrid’s initial diagram and brief descriptions IF you go through the 3-loop braid step-by-step document first. The 3-loop braids felt more difficult while learning than the 5-loops, because I was learning the basic technique with the 3-loops. You’re welcome, Amanda! Thanks for the feedback about learning 5 loops so easily after first learning 3-loop braids, I sort of thought that would be the case but hadn’t directly heard back from anyone on it yet. Happy braiding! Your braids are absolutely beautiful. I’ve always wanted to learn finger looping and find your tutorials to be the most thorough and educational. I started off making my first finger looping bracelet from your 9-loop finger braiding tutorial posted on Youtube which in turn, led me to your website and other sites that showed your tutorials. I saw your 3-loop finger textural/bumpy braids (2 blue string, & 1 white cotton string) on http://www.Scribd.com along with other examples of 3 loop braids. I was wondering if you have a tutorial on how to make the textural/bumpy 3 loop braid posted on http://www.Scribd.com. Can’t seem to find it. Hi, I like your website very much. Until recently I had never heard of loop braiding, but with your tutorials and videos I now have made several braids. It’s a beautiful technique! And I was wondering: in the 3-loop tutorial you say this technique is only suitable for 7-8 years and older. But today I made a 2-loop braid and I thought, maybe that one is also doable for younger kids, as you only use 1 finger/hand, so no difficult coordination between several fingers of one hand. Have you ever tried to teach this braid to kids? Do you have any idea from what age they can learn this? Hi Els, thanks for the note! I never have taught the two-loop braid to a child of any age, so your guess is as good as mine. If you teach it to a younger child, please let me know how it goes. Also, I am rethinking what I said before about under age 7 being too young. It usually is, but I have now seen a very determined 6-and-a-half-year-old learn a three-loop braid. At the same fair, a 7-year old who was already very adept at 3-loop braids learned a 5 loop braid easily. A lot depends on how tenacious and persistent a child is… I usually am cautious about this, though because it can be very discouraging for a child to try to learn something that their fingers are simply not ready to do! Hey I love this page, but I have a few suggestions to make things easier. One, i’d love it if your banner with all the different bracelets on it was clickable, so that each bracelet lead you to the tutorial on how to do that pattern. Two, i’d love a page that has all the basics you need to know, like how to start a bracelet or how to finish it, how to choose colors and stuff like that. your stuff is awesome, and those are literally the only two things i can think of to make this even better! Hi Sydney, Thanks, I agree I need more “nuts and bolts” basic info posts. So far I only have one bracelet tutorial—it’s the fifth tutorial in my list above. My tutorials are mostly just on how to braid, not much about what to make with the braid, it’s a definite weak point! I love your idea about my banner photo, wish I knew how to do it. That header photo is actually on all the pages of my blog, not just the tutorials page. It’s more to show generally what the technique of loop braiding can do, I don’t have tutorials for most of those braids (yet). There’s a link in the sidebar to a list where they are all described, if you want to find out more about them, including links to tutorials for a few of them. I have a tutorial on how to load the loops onto the fingers to get the color order you want for your braid. Check back occasionally, you may see some changes! Thanks a lot for the tutorial. I hit the jackpot here. I was trying to figure out how the braids in an Elizabethan manuscript on ‘purse strings’ in Victoria and Albert museum. (http://collections.vam.ac.uk/item/O11031/manuscript/) were done. Tried a 5 loop flat braid with 2 loop colors and bingo! Dead on match for one of the samples. Now to try others..
You’re welcome! You might also want to check out fingerloop.org, that site is specifically focused on translating the braids in the old loop braiding manuscripts. Their section called “the braid patterns” has the transcriptions from the originals plus modern english translations. Happy braiding! Thank you very much for posting your tutorials. They are extremely helpful. I also have a question regarding the finishing of a braid. Is there another way to complete it in a neater, more flat way than making a knot at the end? You’re welcome! That’s a really good question. I have a post on various ways to start a braid with no knot and no ends of yarn at the upper end of the braid, but not on ways to finish a braid. If you make divided 3-loop braids, or 2-loop braids at the bottom of a braid and tie knots at the ends of those, the knots are much less bulky than a big knot of all the ends. I have a video on this in my 7-loop bracelet tutorial, it’s the third video. (For a video on 2-loop braids, look down near the end of my Tutorials index, just above the spiral braid video links). Braided jewelry is often finished with metal end-caps. (I advise NOT using the magnetic type of end cap closures for bracelets, though! In my experience they easily come apart when pulling a jacket on or off, and the bracelet is lost without your realizing it has even come off. There are other types of end cap closures that are safer than the magnetic ones.) Google ‘finishing kumihimo braids’ and you’ll see a lot of info about using end-caps on braids. Here’s one example. I also recently saw a thin drawstring braid that was finished by sewing a decorative piece of fabric over the ending knot, it looked like a little cone-shaped skirt. The knot was hidden inside, probably stabilized with a little glue and then trimmed short. See one of Marion Hunziker-Larson’s necklaces with beautiful knotted end-coverings here. She uses needle and nylon beading thread to cover the tied-off, wrapped, glued and trimmed end of a braid with fine stitching, wrapping or knotting. (She sometimes teaches classes on this – several braiding buddies of mine and I once got together and commissioned one from her, it was a great class, 2 full days). Just Great! I have wanted to learn this type of braiding forever! Now I can do spiral and V-fells, plus they look good (not like a cob web spider). I can see I’m of on a new adventure. Hi Susi, thanks for the note and congratulations on your braids! I’d love to see them. (Sorry to take so long to reply, I’ve been away from my computer for over a week). Fabulous site! Thank you so much.